While Jennifer mourns, Anissa's relationship with Grace takes a sudden turn. Meanwhile, Markovians make moves in Freeland. Synopsis modified to avoid spoilers. Official synopsis: While Jennifer mourns Khalil's death, Anissa's relationship with Grace takes a sudden turn. Meanwhile, Markovians attempts to abduct Lynn and Odell intervenes. 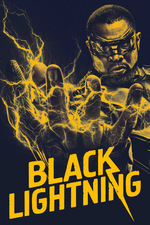 Anissa has been trying to do more than be Thunder with Black Lighting and turned into more of a vigilante than we’ve seen. [...] The problem here is Anissa is getting reckless. She’s more powerful than the people she’s gone up against as Black Bird, but this time she took real damage for the first time. Lynn has been dealing with killing someone in the final episode of season 1. This season she’s having to deal with working with Dr. Jace and being a part of the pod kids dying. A bombshell was dropped when she said she needs Lynn to work on Odell’s plan. Jace isn’t one to give out compliments. Jace isn’t one to give out compliments. And she's not one to reference classical composers with ease: "True, scientifically, I'm Beethoven, but Dr. Stewart is Mozart, and you'll need us both to keep the pod kids alive if you move them." And info on the mural, seen briefly after Perenna stuns those two would-be abductors: SCLC/W.O.M.E.N., INC.* was founded by Mrs. Evelyn Gibson Lowery in 1979 and is primarily a volunteer organization addressing issues of social action, community and economic development. The organization also engages in activities promoting heritage pride, legislative affairs, and programs to strengthen families, and advocacy for economic justice and peace issues. Thanks for posting! I thought this was a strong episode, hearkened back to season 1 in its balance of the superhero plot with the family drama & social justice issues. I was enjoying Jennifer standing up to the principal and then when the principal wanted Jefferson to tell them all to stop it, he was all, "That's the principal's job," holds up a fist and leaves. You go, sir. Not sure what to make of the principal's "I was a poor kid from a drug-addicted home, your dad was a respected journalist" speech there. I appreciated the social justice issues, but I was surprised that Jefferson cut short the talk with Lowry. I suppose when someone is that adamant that they're the victim, there's not much you can say in the moment to show them why their current status is still a privilege not afforded to others. I feel like they're still teasing us with Grace, and I wish she gets revealed already.